Why spy Whatsapp, Viber, Facebook, BBM Messenger need ROOT device? I/ What is Social media networks? 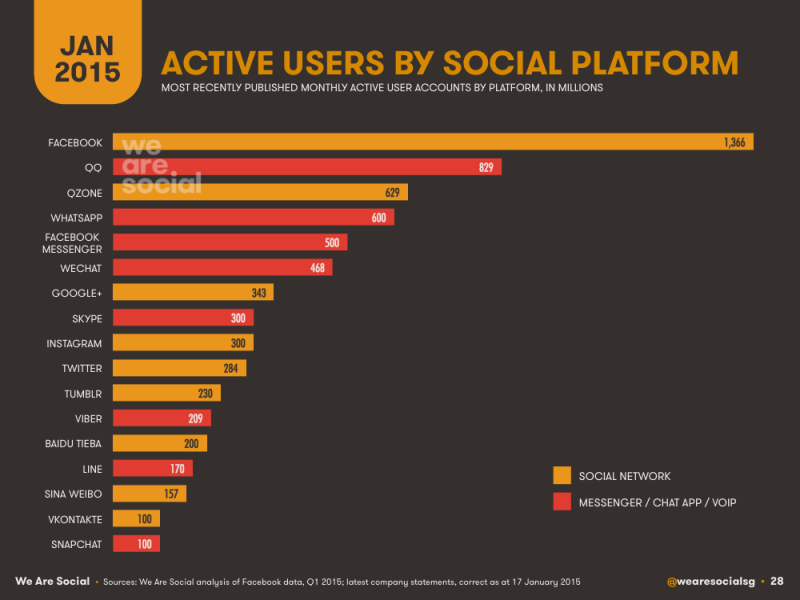 Social media networks are still growing rapidly worldwide, but much of that growth is being fueled by messaging apps instead of the usual suspects. – Download stickers and animated stickers from the Sticker Market; sort and reorder your stickers. – Create group messages with up to 200 participants; manage your group chats as an Admin, editing info and deleting participants. All good things come to an end and sadly this application will no longer be able to spy WhatsApp without rooting the Android, and spy Viber, Facebook, Skype… Changes within the WhatsApp mobile application had closed this loophole and there is no application in the market today able to spy WhatsApp without rooting the Android smartphone. Nonetheless, if you are still interested in spying WhatsApp and more, there are some great applications that you can take advantage to minimize the trouble and complexity of installing a tracking app in an Android. The best option to root an Android with just one click. This app is fast and executes the rooting process without any risk to damage the Android. No need to guess, you can download the app and check compatibility before buying anything. Please root android with just ONE CLICK. You need ROOT SuperUser to access to database third-party app. 2/ Register new account to TheTruthSpy spy app. Hide icon is necessary. Using app Root Explorer from Google Play to access and view database. I know of a very good hacker that can help you with any type of hacking, either phones or computers. My husband was so smooth at hiding his infidelity so I had no proof for months, I was referred to some hacker and decided to give him a try.. the result was incredible because all my cheating husband’s text messages, emails, Facebook, Whatsapp, text messages, Viber, IG and even phone conversations was wired directly to my cellphone. He helped me put a round-the-clock monitoring on him and I got concrete evidence of his escapades..if you think your spouse is an expert at hiding his cheating adventure, you can contact him too at spymasterpro3x(at)GEEmail(dot)com or text to meet him if you’re in the states +1-319983099, God bless..
help men and women like myself. He is a genius, trust me.. 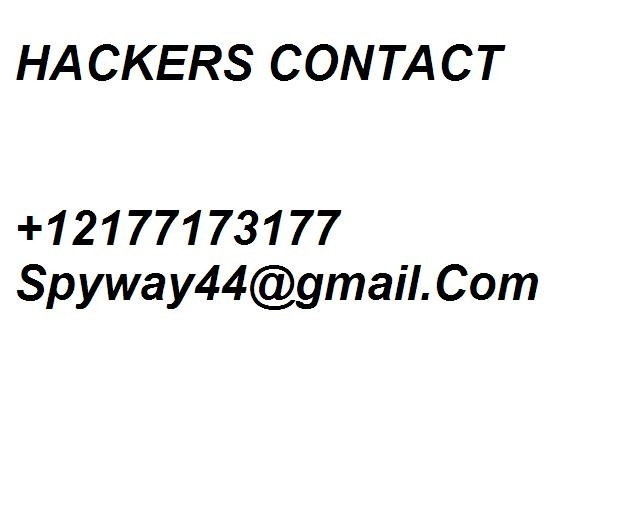 I am from Europe Spain and i never knew this use to work until i gave it try with Certifiedhacker18@gmail .com he is the best hacker contact him. Hack into anyone’s iphone without them knowing from any part of the world at an affordable price. I’m using this opportunity to recommend a very good man. A lady who helped me when i really needed her services, the only one who delivered rightly and didn’t fail me, She even delivered within a very short period of time. ( KristenKrook at gmail com) she’s the best out there…Tell her Reina recommended her. Life has taught me that you can’t control someone’s loyalty. No matter how good you are to them it doesn’t mean that they will treat you the same way. I have been married to my husband for two years with no idea he was cheating. Suddenly i started noticing changes in behavior, i suspected something was wrong. So i confided in a friend who convinced and introduced me to a hacker. He was able to hack into my husband mobile phone, Text messages, Call logs, IG, browser history, deleted messages,viber, Emails and WhatsApp . It seemed as though my life was spinning out of control getting to find out he has someone else. I filed for a divorce just could not continue with lies. If you feel you are been exploited in your marriage and you need proof. I suggest you give scottcyberlord11@gmail. com what’s app +162 8204 3588 Text +185 0631 5597 a try. He has been of great help to me and i believe he can be to you. Thanks so much to netseverhack hacker for helping me hack into my husband’s phone so i could see what he is up to and i was able to catch him red handed,now i am out and a lot happier credit goes to the earlier mentioned hacker for a good job. 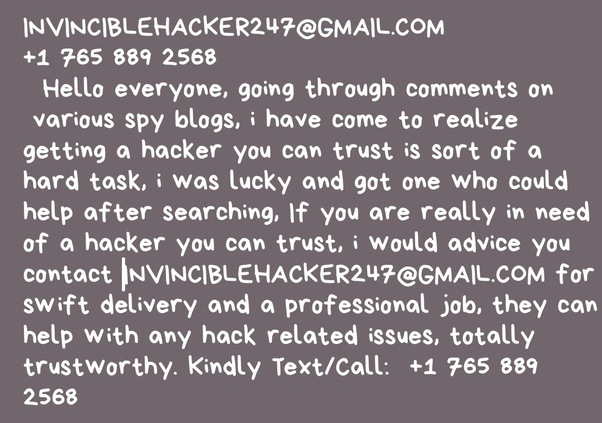 If you are also interested in any sort of hack job you can call or text him netseverhack@gmail. com on you can thank me later. Certified and Reliable Private Investigator. Never take decision when you are Mad, take your time to find out what the Truth : Hachghost516 help me out in my relationship…. I never knew that a phone could be hacked without having physical access with it, all this hacker asked for were a few information on my partner he got into the phone. I immediately paid him and got everything that my fiance had been hiding,he was having an affair with 2 other women which was sickening I must say.. I was on a cross road when I was given this link and truly I didn’t think it could be serving serious . I later hired him and got hacking service within 2days. I got my husband on the hot fire seat when I confronted him with enough evidence . I can’t start typing my life story here because i know its very long but i can say that one person single-handedly reshaped my life..you can get in touch with him via his email with LORDHACK242 (at)-gmail-dot-com.